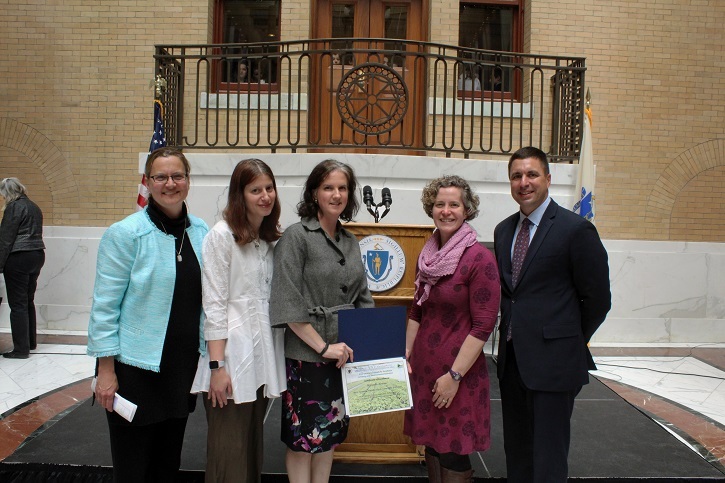 Posted on May 21, 2018 by Kelly M.
Earlier last week I had the pleasure of joining Jill Canelli and Lead Teacher Rina Zampieron at a ceremony at the Massachusetts Statehouse, where Jill and the Drumlin Farm Community Preschool were honored with one of the 2018 Secretary’s Awards for Excellence in Energy and Environmental Education, presented by Matthew Beaton, Secretary of Energy and Environmental Affairs. These annual awards recognize achievement in environmental education, which is a testament to the many years of hard work that Jill and the DFCP staff have put into making our preschool a model of how to get kids outside and learning, tapping into their inherent curiosity and enthusiasm and guiding their creativity and passion for our earth. Mass Audubon is excited to see our nature-based preschool receive this statewide recognition, and we thank Jill and all of our teachers for creating such a special and meaningful place for our students to learn. Please join me in congratulating Jill and the Drumlin Farm Community Preschool! This entry was posted in Education, News and tagged award, Community Preschool, EEA, preschool on May 21, 2018 by Kelly M..